I'm curious in knowing people's approach to filling their portafilters for an espresso. I've noticed two major approaches to this: one is to just dose until the portafilter is filled with a heaping mound of coffee, level it out, tamp, etc. Using the technique it would seem that the amount of coffee (i.e. grams) in the PF depends on the grind but the volume is fairly constant. Alternatively, others weigh the amount of coffee (e.g. say 17.0g), level it out, tamp, etc. Using this approach, the volume changes depending on the grind but the amount of coffee is constant. I'd like to know which approach you use and why. Perhaps you have a different approach altogether! I'd like to hear about that too... thanks!! I weigh, grind, then dose the PF. I level then tamp, tap lightly twice each at the 3 o'clock and 9 o'clock positions. Then, tamp again lightly. I've tried several different methods; weigh first, weigh after, dose into basket only, dose into p/f, ect. Now I weigh the beans allowing for some loss, grind for each shot, dose directly into the p/f, stir, tamp, pull shot. Why? Because it works for me & simplifies the process. For a 16g dose I'll throw in 16.5g & call the resulting dose close enough. I drove myself crazy for the first 6-8 weeks after buying my 1st machine & it took all the fun out of it. Now I relax & do what works for me. Every shot may not be a God Shot but they are all definitely drinkable & thats fine with me. I weigh in a dish, then transfer to the pf. I weigh because the Spaz is so sensitive to over dosing that I want to be sure not to do that. My usual dose is 15 grams. Has anyone experimented with differing grams of coffee on the taste of the final shot (keeping extraction time constant by changing the grind)? Niko was the one who educated me on this. When I first got my Spaz, I attempted to overfill the basket and manually remove the excess. I still don't see where the S1 is "sensitive to overdosing" or even what you consider overdosing. I do 18g doses regularly with no problems & hardly ever smaller then 16g. What do you see the machine do if you "overdose"? By "dwell" are you referring to the time it takes the water to initially get through the ground coffee? Exactly how does the machine "work better"? i.e. what problems have you experienced with larger does? Yeah, that's what dwell is. Wow, I should be in politics! ...now hear this, these damn baskets are so different that some fit 16 grams to the top and some even more! I own a particular double basket that falls in the freak department. So depending which style of basket you own, we can be talking about apples when we really mean oranges :? Ask yourself the ultimate question: Do you weigh your water? So would a larger dose increase dwell time? I would think that tamp pressure & grind would dictate the dwell time more then the size of the dose. I'll play with some smaller doses (14g) tomorrow but I really like the flavors I get in my Americanos with a 16g dose. My 18g doses are strictly for Ristrettos & they do taste very, very good. Wow - sounds like I'm the only one who just does it my feel! So how much does that hold? 21g+? I'm jealous!! Got to get me one of those. 18g is not enough!! NO - you're feeding into the "monstrous American standards!" a triple basket? where did you get one of those? Wow that's a lot of coffee! I would be going through coffee beans very quickly. How many ounces do you pull from 21grams? 2 ounces or slightly less. Tough to tell with the crema. Thanks. And do you find that by using 21g/2 ounce (compared to say a standard 16g/2 ounces), you get better tasting shots? To me - they're just SUPER rich. Many other coffee-based drinks seem weak to me now. Granted, that would probably not be the case with some of your gents' fine work... but around here? eeeeeek! Now you've got me thinking. I've been trying to pull shots as good as my local Mpls coffee shop to no avail. I've been using exactly 15 gr per double forever. I just tried bumping it up to 16.5 gr and I like it a lot better. I'm using Paradise Roasters Classico Espresso. Anyone else? Howard, thanks for calling me a gent! I feel so, well, sophisticated! 16.5g is my standard dose with 18g for a Ristretto. 16g for a 2oz pull. For my machine and my taste, anything more or less is not appealing. zoey wrote: 16g for a 2oz pull. For my machine and my taste, anything more or less is not appealing. Try 18g with a nice long, thick, drippy Ristretto pull & see what you think of the flavor. When I ask Espresso roasters like Intelligentsia & Pt's coffee how they pull their shots to get the flavors they describe on their websites they say they are using 18-21g doses. JohnB wrote: Try 18g with a nice long, thick, drippy Ristretto pull & see what you think of the flavor. When I ask Espresso roasters like Intelligentsia & Pt's coffee how they pull their shots to get the flavors they describe on their websites they say they are using 18-21g doses. that's the part that I always struggle with. The commerical machines are more amenable to over dosing. There was a thread on either CG or HB (actually there are probably lots) that was hotly debated about under and over dosing. Last night I went up to 17gr on the Spaz. I'm getting closer to the taste that I get from my local coffee shop. I don't take that lightly because my goal from the very beginning was to make espresso that tastes like my local shop. I asked them and they're are typically over dosing at 21 gr. So, I'm going to try 18gr on the Spaz and see what that goes. Last edited by bluesman13 on Thu Apr 17, 2008 1:09 pm, edited 2 times in total. Strictly in the interest of providing my fellow forum members info on overdosing with the Vivaldi I made an 18g Ristretto this morning & checked the clearance between the coffee & screen. Before pulling the shot I saw a very small indentation from the center bolt head in the puck. After the shot there was a more pronounced indentation from the bolt but little more then I see after pulling a 16+g double. The 18+g figure is the weight of the beans before grinding but I did clean out as much as possible from the chute & doser when loading the P/F. I was grinding slightly finer then for a 16g shot but tamped normally making sure to pack all of the coffee into the basket. The shot ran approx 35 secs & produced a little over an ounce of Espresso nectar. Thanks JohnB for the info! So how did it taste compared to the 16+g double? Bluesman13: I also became curious about this subject when I observed my favorite coffee shop really overdosing their PF. It got me thinking perhaps that that is the key to their really exceptional espressos. I am going away on vacation for about 1 week but when I get back I will run a taste test with different number of grams for a double holding extraction time and number of ounces constant.... I'll post the results after I am done. boldstep wrote: Thanks JohnB for the info! So how did it taste compared to the 16+g double? cool! Last night I made an 18gr double and it tasted really good. I made another one this am, and, I discovered a huge caffeine difference between a 15gr and 18gr dose! While these seem at first blush like generally helpful statements, they really can be made only vis-a-vis a specific coffee. Coffee is not all the same density; lighter roasted coffee is far denser than dark-roasted coffees. So for example, 19+ grams of a light, north Italian roast coffee can be stuffed into the Spaziale portafilter. But with a really dark-roasted coffee, 16 or 17 grams may be the limit. And now to generalize, 18-21g doses are really not possible with a double basket on any machine; it requires a triple basket. I've done 18g doses with Black Cat, La Bella Vita, Terrior Calabria all in the standard La Spaziale double basket. Have you tried it yourself? JohnB wrote: I've done 18g doses with Black Cat, La Bella Vita, Terrior Calabria all in the standard La Spaziale double basket. Have you tried it yourself? Yes, with the Calabria. It's pushing the envelope and is all the basket will accommodate; the screw head of the shower screens is well into the coffee cake, dry. As I said, it all depends on the coffee and the roast. In the overall spectrum of espresso coffee, the Calabria is not on the darker end of the spectrum, though it is a the darkest end of Terroir's offerings, and hence is denser and occupies less volume than 18g of darker coffees. I'll have to give 18g a try. It took me a while to get the grinder dialed in to do a 2oz pull at 16.5g (in 28 seconds consistently). I just wonder how the heck you cram 18oz in? zoey wrote: I just wonder how the heck you cram 18oz in? It's all about the coffee. With some coffees you will not be able to put 18g in the portafilter. For illustration only, assume that for some lightly roasted coffee 3TBL=18g and it stuffs the portafilter. Now assume a darkly roasted coffee where 4TBL=18g; it will not fit in the portafilter. boldstep wrote: Has anyone experimented with differing grams of coffee on the taste of the final shot (keeping extraction time constant by changing the grind)? Richard wrote: It's all about the coffee. With some coffees you will not be able to put 18g in the portafilter. I pulled a Ristretto shot this morning using 18.3g(beans) of Terrior's Calabria & the center bolt didn't even make a mark in the dry cake. So far everything I've tried fits but the darkest roast I've used would be Black Cat. Well, I tried to cram 18g of very dark and oily beans (mix of Columbian and Sumatra) into the PF. I had to tap it twice on the counter to get it to settle enough to be able to level and tamp it. I could see an imprint of the screen in the puck and an obvious, perfectly shaped bolt head. The espresso was harsh, acidic, predominantly earthy with overtones of charcoal. No es bueno. With my beans, at my grind, my machine seems to love 16.5g. It produces a lovely 2oz shot in 27sec. How long was the pour? Did you grind finer or coarser then you would for 16g? I can't drink a 16g decaf espresso straight so I imagine that 18g would be even more unpleasant. I only do the 18g Ristretto once or twice a week & there definitely is a big caffeine hit. Still I like the richer flavors you taste in a thick, slow 1 oz shot. I didn't bother timing the pull because I didn't change the grind (I didn't want to mess up my 16.5g pulls). The pull was longer, but not horrible. I see what you are getting at though. 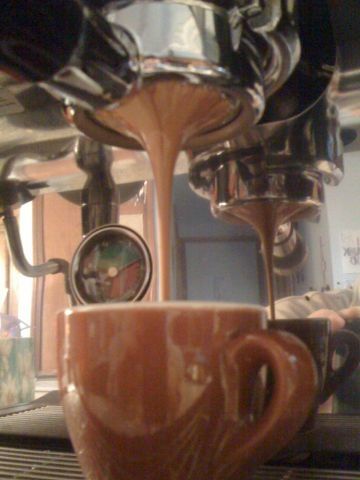 JohnB wrote: I pulled a Ristretto shot this morning using 18.3g(beans) of Terrior's Calabria . . .
Hey, I've been enjoying the Calabria since we last exchanged observations about it. Guess I finally learned more about how to handle it. The recent package I received seems roasted just a bit longer than before; there are hints of surface oiling on some of the beans, unlike the earlier batches I had. zoey wrote: Well, I tried to cram 18g of very dark and oily beans (mix of Columbian and Sumatra) into the PF. I had to tap it twice on the counter to get it to settle enough to be able to level and tamp it. I recently got the Professional Barista's Handbook based on a recommendation on this forum. It discusses exactly what you tried relative to dozing variations. The recommendation was that, for a fair comparison, you needed to eliminate other variables. The main variable here is that the increased mass of room temperature coffee in the PF drops the temperature gradient across the puck more when you up doze. The theory is that consistency depends on having the same coffee temperature when it exits the bottom of the PF. This requires that you increase the water temp when up dozing. I've got that book earmarked. I really need to get it. Interesting notion, chas, and almost obvious once you hear it stated. Before that, well, we were waiting for an insight. I'll have to try raising temperature when making higher doses and triples. Really, great stuff to think on. And we fortunate Vivaldi owners can handle that temperature change with aplomb.